AVG antivirus is the most downloaded antivirus app from Play Store, surpassing by far all competitors. It is a free app that has spread by Android devices and has obtained the best possible reviews regarding its protective function. It has more than 100 million downloads on Google Play. With the spread of smartphones and tablets, the targets for computer criminals have begun to change. The malware is becoming a problem and Android is the main objective, because it is the main operating system of the mobile market. To identify and prevent malware on our Android devices is not always an easy task, and it is increasingly advisable to have an antivirus installed if you’re not quite sure what to install. As always, the best protection is prevention. If we use safe sources like Amazon or the Play Store, we will have no problems, but if we go to more doubtful sources, a good antivirus can save us many problems. 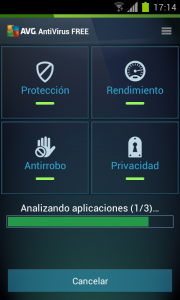 AVG is a free app that offers one of the best protections available on the market. Not only it has the function of anti-virus, but it also includes many utilities like anti-theft feature, which allows you to lock or locate the phone or sound the alarm. We can also erase the memory of the device in case of stealing to protect privacy. The application also influences the performance of the phone, ending tasks that reduce the speed of the device and it makes sure that you can safely surf the Web. You can optimize the internal storage and SD card, carrying games from internal memory to the SD card. Besides, you can block applications and control your battery. This last point is important, because if we have an antivirus installed, the battery lifetime is going to change. AVG can be downloaded from the Play Store completely for free.